Bills rookie linebacker Tremaine Edmunds assisted in a stop at the line of scrimmage to force a fourth down and punt from the Lions in the first half today. 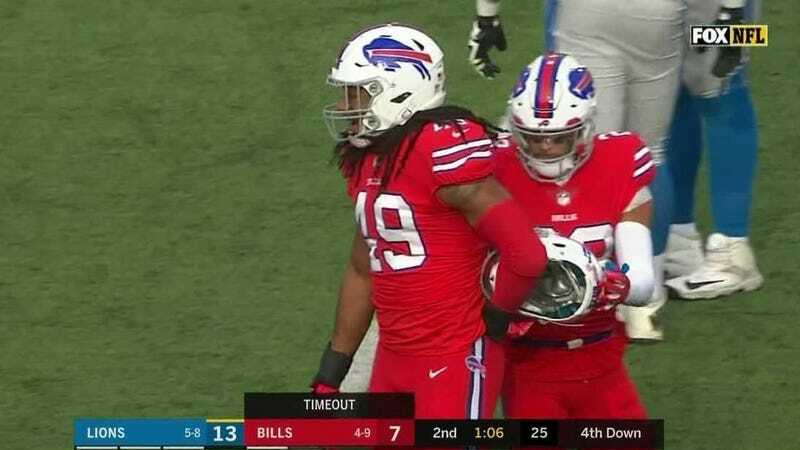 His teammate Jerry Hughes also tried to help, but instead had his helmet stuck to the back of Edmunds’s jersey. Aw, they like each other. Hughes had to take off his helmet after getting dragged a couple feet by Edmunds, and Buffalo was forced to call a timeout so that the players could fix the uniform mishap. What a terrible attempt at rookie hazing.